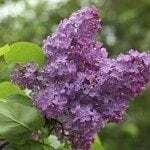 How big and invasive are the roots of lilac bushes? I want to landscape a small backyard and plant a lilac bush close to the fence. There is a concrete retaining wall. How far do I have to stay away from the concrete?